It’s the beginning of October, and that means another Oktoberfest has come and gone in Munich. If you’ve never been to this iconic event, it’s the perfect time to start planning for next year! It’s the beginning of October, and that means another Oktoberfest has come and gone in Munich. If you’ve never been to this iconic event, it’s the perfect time to start planning for next year’s trip. When it comes to Oktoberfest, there’s no such thing as too early (if only to start training up your liver). Here are a few things to keep in mind, whet your appetite for steins of beer bigger than your head, and for the excuse to wear embroidered brown leather shorts. (Although who needs an excuse for that, really?) But I digress. Oktoberfest has been around in some form since 1810 when Ludwig I of Bavaria married Therese of Saxe-Hildburghausen and the citizens of Munich were invited to partake in the celebrations. Over the years, there have sometimes been horse races and parades to enhance the experience – and sometimes cholera and war to dampen and/or cancel it. One of the most obvious constants of course, is the beer. 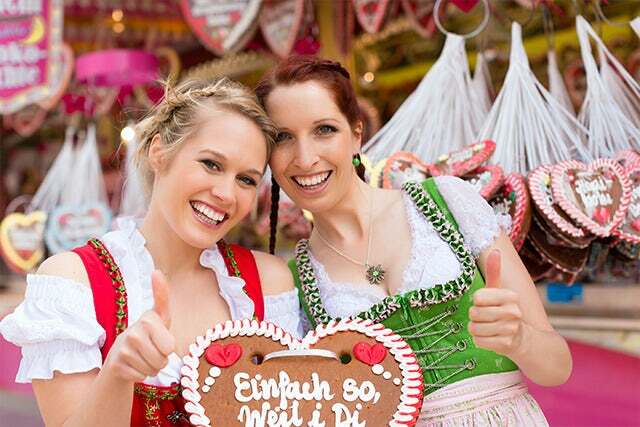 Nearly 7 million litres of beer are consumed at Munich’s Oktoberfest every year. You might not drink alcohol or you might not like beer, but if you’re at Oktoberfest, you simply have to have one. Only a select few breweries make beer that’s allowed to be served here, and all official Oktoberfest beers are brewed within the Munich city limits and must conform to the Reinheitsgebot, a historic set of standards. Something else to know about Oktoberfest is that the beer tents are huge, with some able to seat up to 9,000 people at a time. (The biggest one in history seated 12,000.) They’re also loud and lots of fun. Drinking, singing, laughing, yelling, merry-making, and oom-pah-pahing are just some of what’s going on inside these giant outdoor rooms. Incidentally, after a day or so at Oktoberfest, you’ll get to know a few of the songs they play; there are crowd favourites every year which are played over and over again by the bands that perform, So sing along and sing loudly, even if you don’t know the words. And then there’s the food. Such food! Some of the most amazing German cuisine in existence is served at Oktoberfest and you’ll do your palate (and your spirit) no favours by missing out. There’s hendl (roast chicken), schwienbebraten (roast pork), schweinshaxe (grilled ham hock), steckerlfisch (grilled fish on a stick), würstl (sausages), knödel (potato dumplings), sauerkraut, cheese – the list goes impressively and fatteningly on, and everything is as delicious as it is fun to say. Click Here to see our Oktoberfest offer for 2015!